Let's get this out in the open right off the bat. I'm a chicken. There, I said it. Having made it successfully from Hampton, Virginia in the USofA to St. George's Bermuda, I felt a great sense of relief. I also felt a great sense of gratitude to our friend Lance Ryley for being our third crew. Lance has more experience than both Linda and I combined and so it was a great peace of mind factor having him along. I tend to have more than a little trouble sleeping the nights leading up to one of these passages. The trip south from Bermuda to the Caribbean (Antigua) is much longer... 40% longer. Many people will say that it's usually easier and safer too. There is no gulf stream to deal with and once you get down into the trades, things are usually pretty stable. Still, it's 950 freakin' nautical miles! (that's 1092 statute miles in dog years). I come from New England (motto: don't like the weather? wait five minutes), and I was supposed to trust a weather window that would last for six days?? Stopping off in Bermuda is tricky. Often times, you will be changing crew at this stop which can get complicated. Our original planned third crew had to bow out and we did not know this until we were in Bermuda. We immediately started looking for alternatives, asking people back in Boston, sending out queries on various crew finder websites and ultimately having Linda go out and network along the docks in Bermuda. It was the dockside networking that ultimately landed our third crew person. The tricky part is that if you have to fly someone in, you will likely, eat up some of your weather window (or fly him in too early and have your window fizzle out). Either way, this can lead to going when you shouldn't go. It actually worked out very well for us to hire someone locally since he only need to drive to the boat and hop on! And so it was that Captain Andrew "Smitty" Smith joined Argon for our leg south. With Smitty on Argon's bow shortly before departure from Bermuda. On both of these long open ocean legs (and some previous shorter stints offshore), we had a fourth virtual crew person. Like I do for my own job, this one worked remotely (from his office in Camden, Maine). Ken McKinley from Locus Weather was our weather router for all of these passages. He did an amazing job at helping us decide when to jump and what to expect. He never over or under-sold the weather to us. We got pretty much what we expected every time. Once we had Smitty lined up and what looked like a good window, my sleep improved a bit. The plan was to depart on the afternoon of Friday Nov 11 just after a front (and some lingering squalls) passed. We expected to have a bumpy night the first night but then a pretty nice ride after that. As it turned out, this prediction really did hold for the six days (and beyond). A few days before we departed, a 47' Beneteau came in to the customs dock during some particularly high winds. They wanted to tie up on the wall behind us but the woman from the Yachting Center came running out and shooed them away saying that spot was reserved. Winds were forecast to get near gale force later and their only option was to go out in the anchorage. After hearing some about their very rough passage (especially the previous night where they suffered two knockdowns! ), we let them raft up to us. And in the Small World department, we knew one of the crew from stateside - Linda Allen - from Blue Water Sailing Club. Blue Water Sailing Club sailboats rafted up, waiting for the winds to build later. Recommendation is to depart as planned this afternoon. Conditions are likely to be a bit better than was anticipated yesterday, and favorable wind direction is likely throughout the passage. 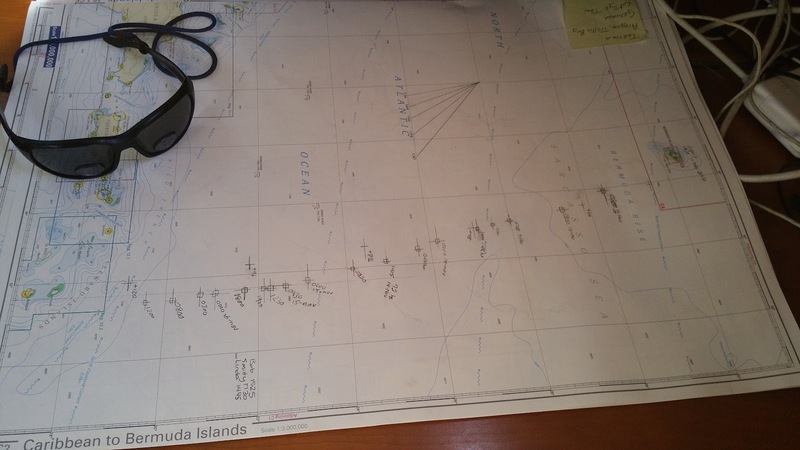 Lighter wind speeds during the second half of the passage may lead to slower boat speed, and this may lead to winds veering to ESE prior to arrival at Antigua, but it no longer appears that a more dramatic veering will occur later in the week. This means that conditions along the southern portion of the route will remain generally favorable into Thursday and even Friday, so slower speed is not a concern. Just a note to let you know that we are departing Bermuda today in a few hours around 2pm local time. The forecast is looking even better than yesterday (see below). We will try to update our position (visible on the blog http://www.argonsailing.com) periodically. We will also send status updates along the way when possible. We are joined on this leg by Captain Andrew "Smitty" Smith from Bermuda. As of now, we expect to land in English Harbor, Antigua Thursday during daylight. Winds will not be quite as strong for departure today, and seas not quite as high. The wind direction will be WNW, and this will continue through this evening with winds backing to W later tonight. Wind speeds and seas will drop off significantly through this evening and tonight. The cold front will pass the yacht by tomorrow afternoon with winds shifting to NW and then N, but the front will not be that active with only a few showers, and wind speeds not that strong. Tomorrow night the yacht may actually re-cross the weakening front with winds becoming lighter and backing a bit. Later Sundayand Sunday night the building ridge to the north will lead to winds veering more toward NE and increasing, and swells will begin to build from the north. A gradual veering of winds toward E will occur through the first half of next week with wind speeds becoming lighter farther south. Swells will gradually subside as well. If the yacht arrives at Antigua Wednesday evening, winds will still be generally E, but if arrival occurs later, winds will tend to veer a bit toward ESE through Wednesday night and into Thursday. The forecast is presented for a departure from Bermuda this afternoon, and assumes a rhumb line route to Antigua. At 1400, we were cleared out of customs (and got our flare gun back) and were pushing off from the dock. This involved un-rafting from our new neighbor who was very happy to get our spot on the wall after we left. As expected, our first night was a little bit bumpy. The seas were not especially high but they were a bit confused. This motion surprisingly had us all not feeling so great. We were all medicated enough to get through it fine however. Smitty on watch. Bob on deck. My first watch. Determined or terrified? Linda sporting her new "Trade Winds" hair style. And my first nap after my first watch. First night very fast sailing and just a little bumpy. Wind much lighter today and sailing with full sails. Everyone is getting rest and we still like each other. just uploaded latest track points. Relaxing on the chute while we're motorsailing for a spell. As the wind began to build, we finally deployed the spinnaker and were able to sail again. Overnight the wind continued to build but still remained very moderate and in-control. We switched from the spinnaker back to the full reacher and had a great fast night. Smitty had a fishing line out for quite a while with no luck. About as soon as we put the spinnaker up however, we had a fish on! Feeling very proud of our well-deployed chute. Chez Smitty working his magic. We ended up getting 4 meals (12 servings) out of this fish! All is well. Very light wind and flat seas. Motoring for most of last 20 hours. Expecting some breeze later. Each sunset was even more beautiful than the sun rises. Winds finally filled in a little yesterday afternoon and we started sailing again around 3pm. We had very moderate winds and flat seas overnight which made for a nice sail. Winds are predicted to only build a little for the rest of the passage. Some very long period swells are starting from the north as predicted. No more fish caught yet. Today is Smitty's birthday. Linda is baking cookies. Smitty's lucky navigation carrot (aka Nav Co). Normally we turn him around so he can see the compass heading, of course. Renaissance Man - sailor, fisherman, chef, and musician. And all around cool guy. One great thing about this passage vs the Virginia-Bermuda one is that we actually had moonlit nights. Not only moonlit, but in this case SUPER MOON-lit! This made the overnights much more pleasant (as did the moderate conditions). The cockpit and deck of the boat was nicely illuminated but the best part is that you could actually see the seas we were rushing into at 9ks. The added bonus were the spectacular moon rises and sets. Supermoon just an hour or so after moonrise. Another easy and pretty fast night. Winds were lighter but on a great angle for this boat. This morning wind was up a bit more but seems to be easing now. Boat speed still very good. We put a little more east in the bank but are now heading due south. No more fish but Smitty provided musical entertainment. We have decided he can stay onboard for the rest of the passage. Everyone is rested and in good spirits. Smitty is many things - including a determined fisherman. As we sailed along at 7-8kts, we were trolling a lure several boat lengths behind. And things started to heat up. We knew winds would veer (turn clockwise toward the east) as the week progressed, but we had hoped to be closer to our destination when they did. Well, wind doesn't always cooperate like that so we ended up doing a fair amount of upwind sailing the last couple of days. This was beginning to get a bit tiresome and I don't think any of us were resting as well anymore. The boat was heeled over pretty far and we had a very noisy bumpy ride. It just becomes hard to do anything on the boat when it's like that and after 40 hours or so, it gets a bit exhausting. As it came time for my watch at 0300 on our last overnight, it was clear that we were not going to make it east of Antigua anymore. So, the plan was to motorsail due south for the duration of my watch (until 0600) and see if we could have a good enough angle to sail from there. The wind, only continued to veer more during my watch and in fact was nearly due south a few times. At 0600 when Linda came on watch, we decided to just motorsail most of the rest of the way. All is well with less than 200nm to go! Winds 10-15E starting to veer south a bit. Boat speed has been mostly mid-6s to mid-7s. Been sailing much higher since yesterday afternoon and that is interfering a bit with getting rest. We have a heeled over, bouncy, noisy ride. We're a bit tired but excited for arrival tomorrow afternoon. Had a fish on but he shook the hook. We still have plenty of pasta. No one has mentioned cannibalism yet. I pretty much passed out after my watch and so I never got to do my "Land Ho" joke. Instead, Linda just nudged me awake and whispered "by the way... land ho". I went back to sleep and didn't even look. Tracking our progress on paper along with all our fancy gadgets. Note the three arrival time guesses. Linda won this bet. As we got around the south east corner of Antigua, we finally had a good enough angle to sail again. The main was already up so we rolled out the genoa and killed the engine. Quiet at last as we sailed into the spectacular entrance to English Harbour, Antigua. Sailing the last 12nm approaching Antigua. 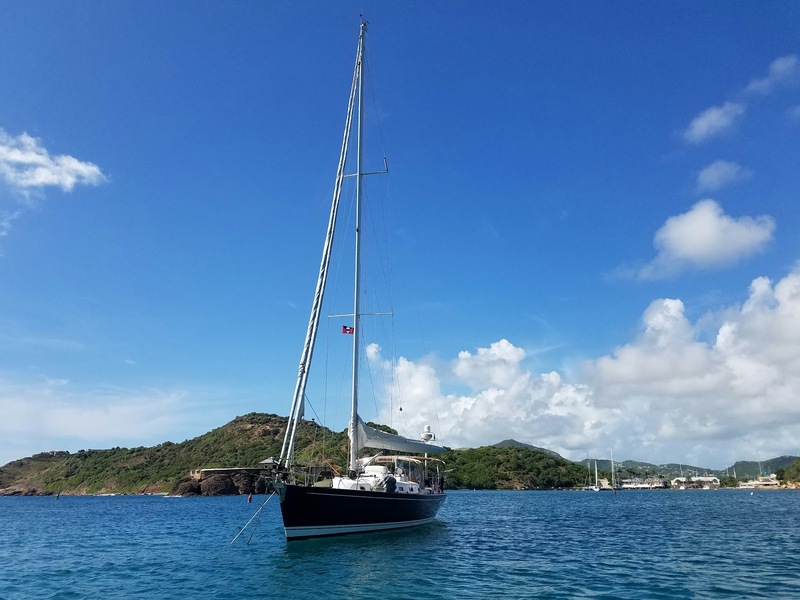 Anchored in beautiful English Harbour, Antigua. Directly in front of us is antigua. Winds veered more on our nose overnight so we have been motorsailing since 3am to maintain direction. Engine is off now and we are under sail to final approach. 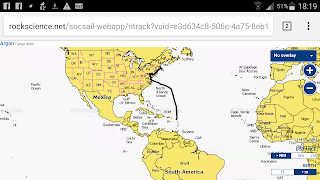 I am sending this using Mobile data instead of $10/mb satellite data. Toasting a successful passage and enjoying Mike's Sloe Gin under the Caribbean sky. I love it! Great job guys! Enjoy the island living for a while! Such a wonderful journey, I'm learning a lot from you as you progress. (Bill Leslie) So excited for you guys!! Hard to believe you and Argon are all the way down the globe like that! Have very much enjoyed reading your blog and seeing the pix - wishes for continued fun! !